Beach theme wedding cakes are beautiful but they can be expensive, instead of spending a fortune you can easily recreate the look yourself. The first cheap wedding cake idea is to use store bought celebration cakes, most big stores do them and you can buy them in different sizes which is great for creating a tiered wedding cake. Choose the sizes that you want and then add your own decorations. Start by attaching a 1" ribbon around each cake, you can buy ribbons with shells and other beach designs or find a ribbon that fits with your color scheme. 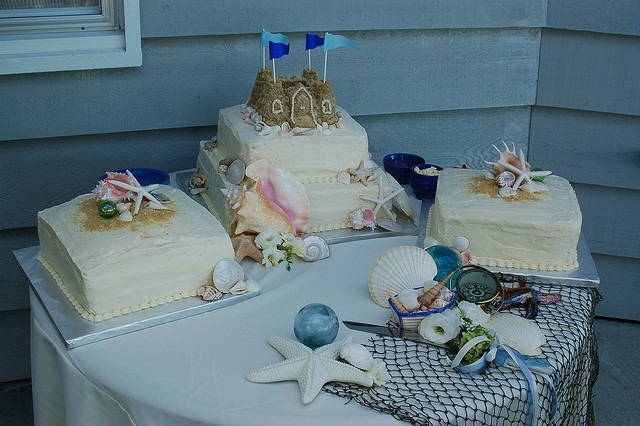 Turquoise blue or yellow are popular colors for beach theme wedding cakes. Now you can add the decorations these can be real or gumpaste; shells, starfish, coral, mini beachchairs anything that fits on the cake can be used as your decoration. If you are lucky enough to live near a beach then you could have a hunt for some free decorations, just make sure they are thoroughly cleaned before you put them on your cake! If you don't want a traditional wedding cake then create a chocolate wedding cake, make the tiers in the sizes you want. Cover with colored fondant icing if your beach wedding is outdoors or it will be hot. If you iced it with buttercream or ganache it could slide off your cake when it gets hot - not a good look for the wedding photos! 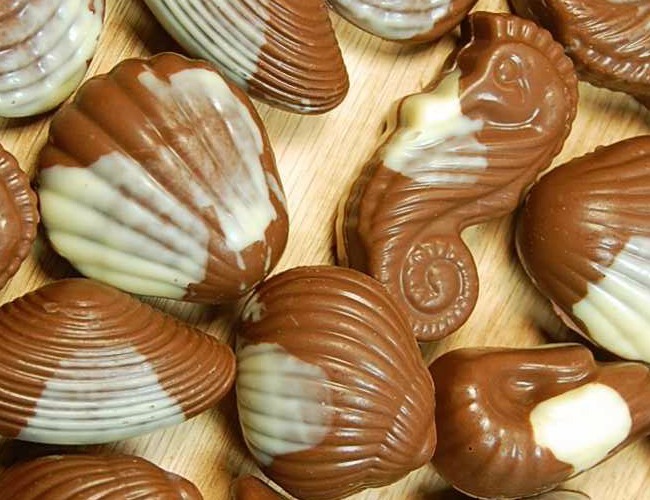 The best bit about having a chocolate beach wedding cake is that you can use those yummy Belgium chocolate seashells and seahorses as the decorations. They would look stunning against a pale blue cake! Cupcakes also work well for a beach themed wedding, you can go with traditional and have them decorated in white fondant icing and then topped with a chocolate shell. You could have fun toppings with mini sandals, bucket and spades, sunglasses, or a bikini for the girls and shorts for the boys! Here are some pretty and very cute sea decorations that would look great on your cakes and if you had any left over you could use them for favors for your guests. For your cake topper you can add more shells or you could have the bride and groom sunbathing on the top. It depends on the style of your wedding. You can use all sorts of little figures to decorate your wedding cake. Cake toppers are great as you can add them to a store bought white iced cake and you immediatley have a themed cake. So although you may spend more on the topper than you were thinking of doing you could save money in the long run. There is no need to spend a fortune on your wedding cake - afterall it is only cake!